What Would Alien Life Mean for Religion? Scientists believe they may have discovered a habitable planet circling a small star relatively close to the earth’s solar system. While many exoplanets have been discovered in recent years, this one has proved to be the most promising candidate for a planet beyond earth that harbors Earth-like life. But if life is discovered on this or some other planet, what will be the implications for the religious and spiritual beliefs of earth’s inhabitants? As it turns out, the discovery of extraterrestrial life may either challenge or reinforce one’s beliefs, depending on the tradition one follows. 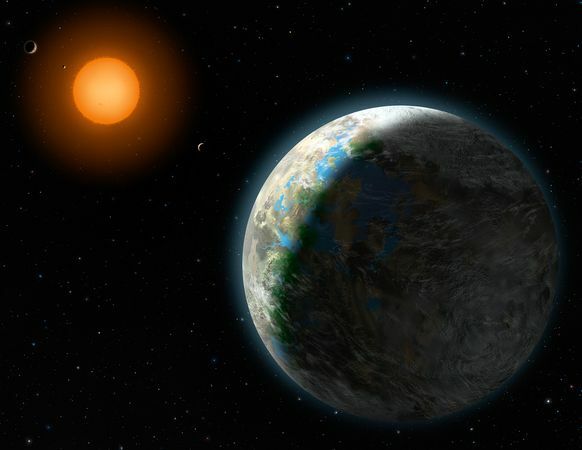 However, habitable does not necessarily mean habitable for humans—the carbon dioxide-rich atmosphere would almost certainly asphyxiate a human, so most likely very different creatures (if any) will have emerged on this planet through the process of biological evolution. The common denominator is liquid water, which is viewed by scientists as the universal medium or solution for the emergence of life. In addition, even though the star system is only twenty light-years away, it would still take the space probe Voyager 1 three hundred millennia to reach it, which means that humans will have to come up with something like warp-speed or worm-holes to get there before they die—and such technological feats require an astronomical amount of energy. But what would the discovery of extraterrestrial life imply for the major religions of the world? For most evangelicals, it is problematic. The belief that humans must accept the blood sacrifice of the Christ-avatar to redeem themselves and go to heaven might be entirely undermined by the discovery of intelligent aliens. If the fall of Adam and Eve and the resulting revelation of Jesus Christ meant to correct their error were earthly events, either aliens do not need Christianity since they have not yet fallen (having no Adam or Eve), or they cannot accept the sacrifice of Christ since they are ignorant of it in the first place, hence they are doomed to eternal torment in some extraterrestrial space-hell. Evangelical Protestants would then need to send missionaries to places like Gliese 581d to convert the alien heathens and help them escape such a fate. But it is not exactly fair for God to have such expectations of aliens, or to punish them for failing to meet them, and yet most evangelicals are not very willing to change their theology either, which is probably partly why they prefer the assumption that aliens do not exist. If one is Catholic, the problem is slightly more complex. Many are familiar with the recent decree by the Vatican that the existence of extraterrestrial life would not necessarily conflict with the teachings and traditions of the Roman Catholic Church. Because Catholics believe in papal infallibility, they can share the pope’s acceptance of alien life. Yet the papal decree about aliens does not necessarily mean that aliens can go to heaven. In addition to the gospel, believe Catholics, sacraments and rites such as the Eucharist and the absolution of sin by a priest, as well as adherence to Church teachings on these things, will grant one access to eternal paradise. The problem is that on a different planet, it is very unlikely that a church exactly like the Catholic Church, with the same rites, sacraments, and religious literature, will exist, therefore the inhabitants of that planet have no resources to get to heaven. Again, it is not exactly a fair expectation on the part of God, and yet few Catholics are willing to relinquish their cherished beliefs, so they are forced to assume any aliens created by God will automatically suffer eternal torment in hell. But ETs do not create a problem for all religious and spiritual traditions—in fact, some of these traditions embrace the idea, and some are even founded on it. A great deal of New Age thought and spirituality accepts the reality of such beings, in part because this particular collection of faith traditions does not typically include the hard-and-fast Christian doctrines that would by definition relegate aliens to hell. Similarly, Buddhism and some other eastern philosophies emphasize certain practices, beliefs, and traditions which are so generic that any intelligent being could theoretically subscribe to them. Sometimes these teachings may sound specific, but one might also view them as metaphorical or symbolic representations of universal ideas and phenomena. And some more controversial theorists even propose that some of the gods of ancient man are in fact deified extraterrestrial beings with highly advanced technology, which man described in terms they could understand. So there are many faith traditions that are compatible with the existence of intelligent life beyond earth. Some religions have a vested interest in debunking the claim that aliens might exist, because the authority of such religions would wane as people began to realize that their associated theologies did not account for such beings; however, other religions which allow for or presuppose the existence of aliens would begin to flourish as people’s beliefs were validated by the discovery of such beings. If and when such a discovery is made, those who cling to cosmologies denying the existence of life beyond earth will be forced to seriously re-examine their beliefs. To refuse to do so would only reflect stubborn pride. Tell us what you think as a minister in a nondenominational church, given your familiarity with the stories of different religions. Would the discovery of intelligent life beyond earth challenge your beliefs, or validate them? Learn more about the different mythologies and creation stories of the world’s religions by visiting our Guide to Divinity.